We normally review consumer electronics, software, and hardware in the tech industry and web design industry. However, from time to time, we like to do random reviews on non-tech products. Most of appliances have smart technology inside of it–meaning it is controlled with a motherboard inside that is doing all the thinking. So my point is that most of appliances have modern technology in it. Now to the part you’ve been waiting on. 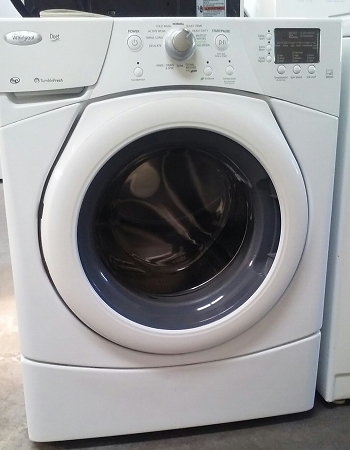 If you’re WhirlPool Washer looks similar to this washer below then you’ll want to look at the video below the picture. This shows you a way to troubleshoot tour Whirlpool washer if your display shows an E1/F9 error code. You may also see a code for SD. You either have too many Sid’s from too much detergent (SD code) or your drain pump filter maybe clogged (E1/F9). This fix is easy to do without having to spend money for a tech to come out and do it for you. Thank you so much for your video. I was not looking forward to telling my very overworked, truck driving life partner that on top of chopping up firewood and all his other things that he needs to do, that the washer quit. We’re both older and I’m disabled, but I think I can handle this job. ( Warning, I’m long winded) I was a wastewater operator for 10 years..to look at me you’d never know lol. I’m a typical looking 53 year old woman, my partner is 63. All that background is so you’d know just how much it meant to me to find your extremely easy to follow instructions, pleasant voice and professional manner. Bet you don’t leave stuff in your pockets anymore lol. I think our culprit will be dog hair. 4 dachshund, three are long haired. Take care, and I am subscribing to you page and leaving you a very grateful, LIKE. I’m glad the video helped! When I was working on my washer I decided to record it. I’m glad I did! I appreciate you being long winded and enjoyed reading your comment! Thanks for subscribing!